Sydney's Fashion Diary: Happy Fourth! I am super excited for a short work week. Fourth of July has always been one of my favorite holidays. I am looking forward to a weekend full of quality time with my family and good eats. Heading downtown to Red White & Boom is on our agenda tonight. If you're looking for a breathable, light weight summer sweater, this one is a terrific piece. Comfortable and incredibly soft, it has become my favorite new sweater. I wish you and your loved ones a safe and happy holiday and don't forget to honor those who have fought and continue to fight for our freedom! I really like those midi shorts! I have an old pair from AE, but I feel that they're too short for me now that I'm no longer in college (and haven't been for a while haha!). But I do love their fit! Will be giving the midis a try! Happy 4th of July, Sydney! 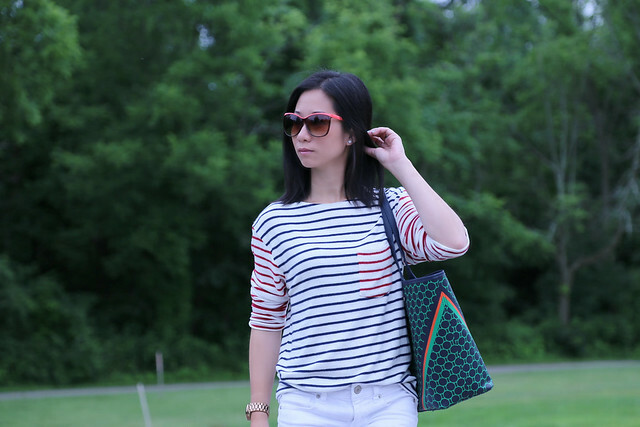 Such a cute casual outfit, love these stripes! Fourth of July is also one of my favorite holidays! (I got engaged on 7/4!) I really like your shirt... It's not only festive, but to me, it screams New England summer. Hope you have a wonderful time with your family, Syd! :) Happy Holiday! happy 4th! what a great look!! Love the 4th of July inspired look! Loving the stripes on you for the occasion! Love your fashion blog!! Happy 4th of July to you!! I love stripes, definitely one of my favourites and this design is even more amazing and unique. Love the design and colours together, very appropriate for the 4th today.